Shirts With Random Triangles: No. 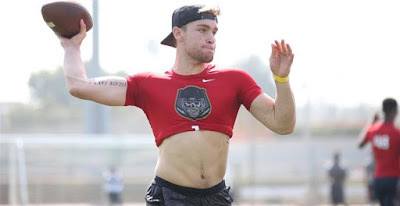 1 Ranked Dual-Threat QB Prospect Tate Martell Commits To Ohio State's 2017 Recruiting Class. Martell has previously committed to Texas A&M, but decommitted from the school on May 5. 247Sports grades Martel as a composite four-star dual-threat quarterback prospect. The recruiting site ranks Martel at no. 1 in its 2017 dual-threat QB prospect rankings, at no. 1 among 2017 prospects from the state of Nevada, and at no. 33 in its composite 2017 national prospect rankings. Martell attends Bishop Gorman High School in Las Vegas, NV. He stands 5'10.5, and weighs 203 lbs. Ohio State's 2017 recruiting class now stands at 14 members with the addition of Martell.